A traditional porter in which the smooth character of chocolate malt is balanced with the bitterness provided by Target Hops. 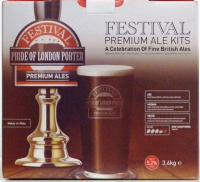 Pride of London Porter is a dark, smooth tradional Porter style beer in which the smooth character of chocolate and roasted malt is balanced by the bitterness provided by Target Hops. An amount of brewing sugar is provided in order to increase the alcohol strength to approximately 5.2% ABV without affecting the balance and body of the beer.